On April 3, Governor Brian Schweitzer of Montana issued an amendatory veto of House Bill 418. The bill, designed to attract a horse slaughter facility to the state, would have effectively removed the ability of Montana residents to challenge such a plant's operations in state court. Within hours, the bill's sponsor, Representative Ed Butcher, had issued a defiant statement vowing to challenge the Governor's amendments and to send the bill back to him for an up or down action. A special kind of person is required to defend horse slaughter, and Ed Butcher is such a man. A classic fight was brewing and the only thing missing was an old west saloon piano banging out a frantic chorus. Butcher began his long political career in 1992 as the Chair of Montanans for Term Limits. He was first elected to the Montana Senate in 2000, but by 2004, his interpersonal skills and redistricting catapulted him into the House of Representatives. A determined man, Butcher appears resolved to remain in office until his goal of term limits is finally fulfilled. Nor is Butcher one to shrink from a fight. An outspoken politician in the rich oral -podiatric rhetorical style of former Montana Senator Conrad Burns, Butcher came under a storm of controversy by referring to special needs children as "vegetables". More recently, he referred to his fellow legislator and Native American Jonathan Windy Boy (Chippewa Cree) as "Chief Windy Boy" and inquired whether he would wield his vice-chairman's gavel as a "war club". Butcher was later reported to have said he learned a valuable lesson about how a simple joke can easily be misunderstood. True to his self-criticism, Butcher refrained from any semblance of humor as he hurled insults at the opposition to his horse slaughter bill. In a subsequent interview, Butcher said that the Governor's amendments would "gut" his bill and leave a slaughter house open to "harassment" by "two bit hippies". The comment could be viewed as a reference to the Kaufman, Texas Board of Adjustments, the DeKalb, Illinois Sanitary District and the Canadian Food Inspection Agency, all of which have "harassed" horse slaughter plants in recent years over their discharges and dumping. During earlier hearings in the Agriculture Committee, former Mayor Paula Bacon of Kaufman, Texas had told legislators of the long running problems her town had experienced with the Dallas Crown horse slaughter plant, including such graphic details as the plant's installation of a pump designed to force untreated waste down the sewer. The result, Bacon recounted, had been blood rising into the bathtubs and drains of the surrounding community. Butcher was quick to counter Bacon's testimony by saying, "I don't care what Paula Bacon says." That devastating retort on Butcher's part was apparently all the committee needed to hear and they quickly passed the bill to the Senate floor on a 7 to 2 vote. The bill then went to the full Senate where it passed by a narrow majority, eventually winding up on the Governor's desk. In response to Butcher's claims that the bill was effectively "gutted" by the Governor's amendments, opponents of the original exculpatory language point out that only the outrageous provisions were eliminated and that the title, bill number and Butcher's sponsorship remain entirely intact in the amended version. A complete override of the Governor's veto was not in the cards, and neither side wanted a half victory. So the House and Senate voted to reject the amendments, forcing a showdown for the Governor. During the debate on the bill, Representative Butcher referred to "the Belgians", who were interested in locating a plant in Montana if they could be protected from legal "harassment". He assured his fellow legislators that it would be a modern, clean facility and give Montana a much-needed economic boost. However, recent developments at the Belgian plant in Canada provide interesting insights. Last December, the Canadian government suspended the operating license of the Natural Meats (formerly Natural Valley Farms) plant in Neudorf, SK. The plant was run by the Velda Group, referred to by Butcher as "The Belgians". This was the same Velda that had owned the Cavel plant in DeKalb, Illinois; which accumulated over $100,000 in fines for sewer discharge violations. It had been shuttered under a new state law in September, 2007. Butcher's "Belgians" had barely transferred their Cavel operations to the Canadian plant when they fell victim to an ancient Chinese curse, "May you come to the attention of those in authority." The plant was first the subject of a Canadian Broadcasting Corporation story over its treatment of horses. 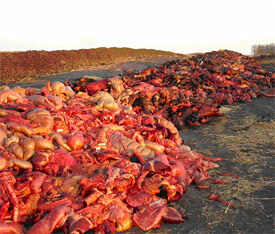 The Canadian Horse Defence Coalition then documented their dumping mountains of entrails on the open landscape near the plant and allegedly letting blood enter a local river. In the end, the Canadian Food Inspection Agency would say only that the license had been suspended for "food safety concerns". After a temporary reinstatement in January, the plant was closed permanently in mid-February. As regards the highly touted economic boost Butcher promised his Belgian friends would bring to Montana: When it was closed, the plant was already in receivership with debts reported to be in excess of $25 million dollars. In the light of these revelations, Representative Butcher's plan reminds one of the classic westerns where the villain, twirling his mustache and laughing wickedly, ties the girl (in this case the citizenry of Montana) to the tracks. But will the hero (Governor Schweitzer) gallop up, cut the ropes with a slashing veto, and release the hostages? Stay tuned for our next exciting episode. John Holland is a freelance writer and the author of three books. He frequently writes on the subject of horse slaughter from his small farm in the mountains of Virginia, where he lives with his wife, Sheilah, and their 12 equines. Holland is a charter member of the Equine Welfare Alliance and serves as senior analyst for Americans Against Horse Slaughter, an organization composed entirely of volunteers.